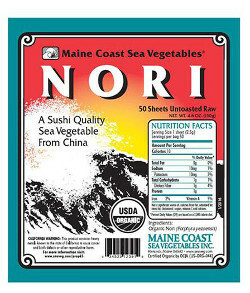 Use Maine Coast Sea Vegetables Nori Sheets to make traditional sushi or California rolls, or invent your own fillings! This Nori is OCIA Certified Organic as well. Maine Coast Sea Vegetables is committed to the rediscovery of this ancient food source from the sea. Their mission is twofold: to provide high-quality North Atlantic sea vegetables as user-friendly foods and to build long-term relationships with their suppliers and the environment.